You are here: Home > Trading FAQs > What is Spread Betting? What is Spread Betting? Is Spread Betting Gambling? So what is Spread betting? Most investors reading this article will have bought and sold shares through a traditional stockbroker. And many readers will be wondering how they can get involved in the markets for the first time. So I thought of taking a moment to describe what spread betting is in case there are people out there who don’t know what it is. Private traders – large and small – now have access to a quick, easy and low cost way to trade individual shares, foreign exchange, stock indices, commodities and interest rates. Until recently investing and trading was done via traditional broker channels with very limited markets. To make any decent amount of money one required a large outlay of cash. One also needed a great deal of patience before seeing any good return on those investments. With the advent of spreadbetting you pay no commissions or other fees when you trade. You can also make a great deal more money than you initially put into your account. You can make this money quickly if you make the right calls. But, you can just as quickly lose it. However, one shouldn’t blame losses on spread betting as a trading medium itself, not least because there is no evidence to suggest that trading other mediums such as options or futures or shares lead to higher levels of success. You may get greater ‘kudos’ from others, if you use a so called ‘real trading platform’, but for me, gambling does not have to mean wild stabs in the darkness either, and I don’t believe that reasonably consistent winnings are impossible to someone with the right mindset, discipline etc., besides – does it matter to your pride if you’re eventually considered, by your peers, as only a gambler who wins money more than you lose? Spread betting is similar to normal share trading, commodity trading or foreign currency exchange trading (forex), plus you can trade on many other markets. Let’s focus on share trading in order to illustrate what spread betting is. In traditional share trading, you would buy x number of shares and then sell them at a later date for a profit (or loss). You might also receive dividends or rights issues. In spread betting, you can act in the same way, buy some shares and sell at a later date. In addition to this you can “short sell” the share. For example, recently Tesco went down in price due to poor trading conditions and an announcement that they are closing stores. Say back in December you had thought Tesco were going to go down in price, you could have sold (gone short) X number of shares in Tesco and then left it for a few weeks, and then today would have been your golden day, and you might have decided to close your position (by “buying” the shares – reverse logic here – normally to make a profit you buy shares low and sell them high, in short selling you sell them high and buy them back low). You would have made a profit because the price went down. Another thing you can do with spread betting is leveraging. That is, traditionally you might have had £1000 and liked Share A which was priced at £1 per share. You could buy 1000 shares in Share A, however with spread betting you can leverage your £1000 and buy £2000 worth of Share A, giving a 50% deposit factor and a 2 x leveraging factor. This would allow you to make twice as much profit. Naturally it exposes you to potentially twice as much loss. A classic mistake new spread betters make is to over-expose themselves (leverage too highly). They might think “I can buy £10,000 worth of Share A” with a 10% deposit, this way I can make 10 times as much profit on my initial £1000 investment. However this is leveraging too highly. What if the the share drops by 5 pence to 0.95? Your account balance is now at £500 and you’re starting to panic – I’ve nearly wiped my account! The traditional method of buying 1000 shares would leave your account balance at £950 – stress free and plenty of time for the price to recover and move into profit. Basically spread betting is classed as gambling which is why its tax free. If you believe that you know which direction a stock is going to go, you can place a bet, gambling a chosen amount per penny change in the price – for instance, you could bet that shares in Marks & Spencer are going to go up, and wager, say, £10 per penny. And remember that with spread betting you have to bet pounds per point meaning you have to transact with your bookmaker. Remember that you have to bet not trade otherwise you lose the no Capital Gains Tax part of the deal. Spread betting is sometimes compared to the bucket shops that prospered in the United States in the late 19th and early 20th centuries. These ‘shops’ which catered to investors with small amounts were however abolished in most states by 1920. In the United Kingdom, financial spread betting takes its origins from Stuart Wheeler; a banker who in the 1970s decided to set up a system permitting his wealthy pals to bet with each other on the gold price. Wheeler later went on to establish the Investors Gold Index which is now knows as IG Group and remains the UK biggest spread betting provider. However, it wasn’t until the year 2000 that spread betting really took off with the rise of the Internet contributing to the growth. Investors and traders tend to use financial spread betting to speculate on short and medium-term trends in the financial markets. In fact spread betting also allows you to trade on many more markets and instruments than a traditional share broker will allow. But sometimes when I’m faced with a blinking cursor on a computer screen I feel like someone is teasing me: Do you feel lucky? Now don’t mistake me, don’t think I have a great desire to gamble, I’ve never bought a lottery ticket or bet on a horse. Having said that sometimes I wish spread betting wasn’t called spread betting. I wish the powers that be would allow us to call it for example spread trading, because this form of trading really little to do with betting – unless of course you believe that speculation on the markets amounts to gambling. In fact, spread betting is quite similar to ordinary trading, apart from the fact that it is easier to understand! Instead of say, trading 1 lot for example, you might place a “bet” of £1 per point/tick. It is much easier to properly calculate risk when spread betting. 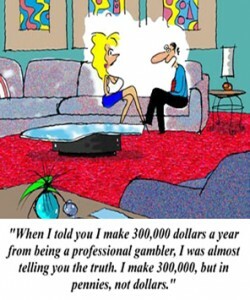 In any case you can ‘bet’ on all financial markets. So if you want to buy BP shares then you could instead bet on the price going up. Spread Betting companies offer these bets and their prices follow the share price. So you bet on the price going up. If you were going to buy 5000 shares at their price now around 350p then you would need 17,500 pounds. Or you can bet on the price going up and you can bet 50 pound per point. Which is basically the same result as buying 5000 shares. If the price goes up 10 points you make 500 pounds with the spreadbet (10 points multiplied 50 pound per point) by or if you had bought the actual shares. However with spread betting you don’t need 17,500 pounds to ‘trade’ – you can achieve the same result with only, say, 1750 pounds deposit margin. The cost of the transaction is the spread so the buy and sell price are different. That’s how they make their money. The spread is smaller on the shorter time frame spreadbets but you can always choose choose longer time frames. The Daily spreadbets have the tiniest spreads but are closed by your spread betting provider at the end of the trading day. You could roll Daily bets to the following day but you incur a small charge (referred to as financing) for doing so. 3 / 6 / 12 month bets have a larger bid-offer spread but you can keep these open for longer time periods and there is no financing charges. Again, you can roll these over to the next quarterly period but you have to pay a charge in the form of the spread for doing so. The cost of financing is built into the future price e.g. the September contract for instance. Although, it still usually works out cheaper to utilise quarterly bets if you are taking a longer term view, as opposed to rolling a daily bet every day. Comment: Spread betting isn’t my thing, ok no Capital Gains Tax but ask yourself why not, its because HM Revenue & Customs know more people lose than win on spreadbets and therefore also no capital losses. That logic doesn’t hold. If you execute the exact same trading strategy with shares or CFDs or spreadbetting, you will still profit by a similar amount (taking into account commissions, taxes and spread costs). Just because it has the term “betting” in it, it doesn’t mean it’s gambling, just as much as using the term “invest” and opting for CFDs doesn’t mean an “investor” isn’t a degenerate gambler thinking he can beat the market. Using the term “invest” doesn’t make you any brighter or more likely to profit than a gambler. Bottom line: if you are risking money “investing” in shares, trading CFDs or betting via a spread betting vehicle, you are a gambler. The difference is simply whether you’re making money or losing money. In itself, spread betting is a great tool, but that’s all it is. If you are not a good investor, spread betting will magnify your lack of ability. It offers leverage, and protection from capital gains. Note that financial spread betting is not usually accessible to clients in the USA at this time due to local laws. “Please keep in mind that spread betting is effectively speculating on short-term movements in the stock markets. It is a leveraged way of trading and therefore you can lose MORE than you initially start off with if you are not careful. In addition you will be charged overnight financing interest for positions that span more than a day. So this is not an alternative to a standard brokerage account if you’re thinking about holding your investment for years on-end. Spread betting is designed for active and short term speculative investment. The risks are high, the rewards are high. Tread with care”. RISK WARNING – A spread bet is margined product; it is possible to lose more than your initial margin deposit or credit allocation as well as any variation margin that you may be required to deposit from time to time. Therefore you should only speculate with money that you can afford to lose. Spread betting may not be suitable for all customers; therefore please ensure that you fully understand the risks involved and seek independent advice if necessary and prior to entering into such transactions. Spread betting also allows you to trade on many more markets and instruments than a traditional share broker will allow. Overall, spread betting is a fantastic tool providing a lot of opportunities to make a lot of money. However it is also a very easy way to lose a lot of money. NEVER, EVER USE MONEY TO SPREAD BET THAT YOU CAN’T AFFORD TO LOSE. NEVER EVER BORROW MONEY TO SPREAD BET. Please trust me on this. You might be after big profits quickly but I guarantee you that you will lose your money fast and end up in a nightmare position making bad decisions brought on by irrational/emotional thought. You want to be calm and confident when placing a trade, having considered both the upside and downside potential – always remember the the price may move in the opposite direction to what you think – so if the worst happens, are you ok with losing your stake? Why not start by saving up £1000 then making a number of small £50 trades. Sure it’s not as exciting as the big money, but just think, if you’re successful, you might double your money to £2000. This shows that you might be on to something. Do it again, double to 4k. Double it 8 more times and you’re a millionaire. Risk managent is key. If you are a natural gambler, spread betting is probably not for you.